As Lake County's population increased, the board of county commissioners was determined to maintain a quality of life in the area that would be attractive to residents and visitors alike. Part of this entailed keeping the county clean and litter free. So the county set out to get citizens involved in the project, and, as the board of commissioners quickly found out, the easiest way to do this was to use Crowdsource Reporter app from Esri. The executive director of Keep Lake Beautiful approached Lake County's GIS division with these challenges and asked if there was a way to allow citizens to report areas of litter and map them for easy monitoring. 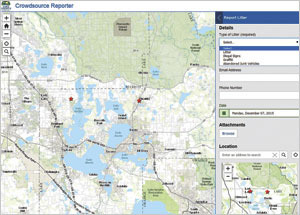 After determining specific needs for the project, the solution was obvious: Keep Lake Beautiful would use Crowdsource Reporter, a configurable, web-based app template from Esri that allows citizens to submit data about areas of concern, as well as map them and attach photos to illustrate the problem. 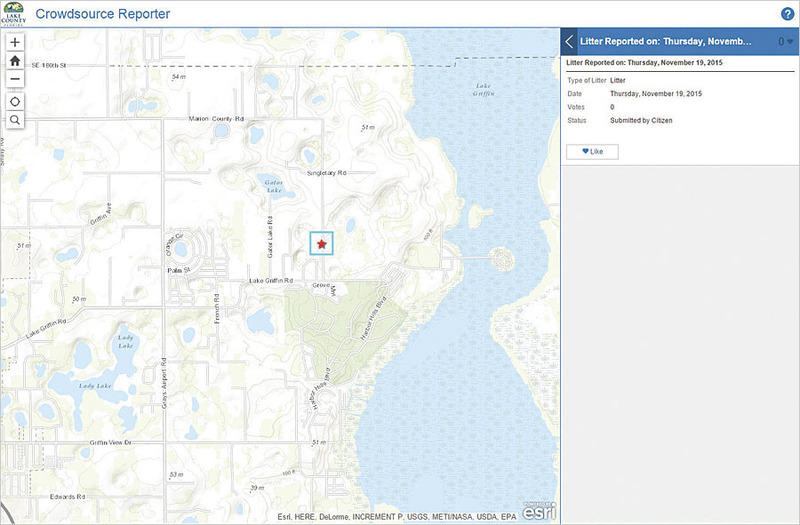 Lake County residents and visitors can access the Crowdsource Reporter app online via a link on the Keep Lake Beautiful website or from the Lake County GIS division's Interactive Maps & Apps Gallery. With the app, users can click the Report Litter tab to see all the litter sites recently submitted or under review. 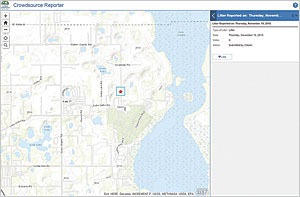 To submit a new report, users click the Submit a Report button, fill out a short form, identify the area on a map, and click the Report It button. They can document litter, graffiti, illegal signs, and abandoned vehicles. If a site has already been identified, other citizens can click Like in the app so the site garners more attention. 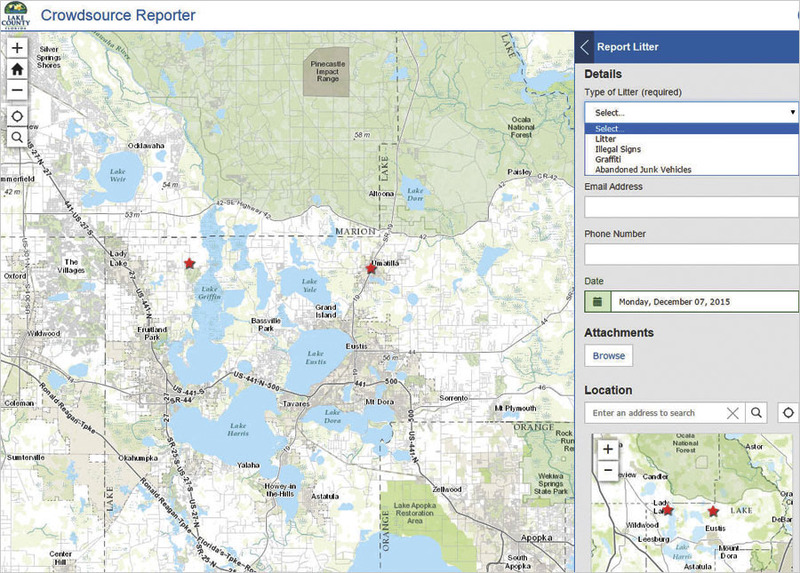 To make sure the app was compatible with Keep Lake Beautiful's needs, the GIS staff not only created the feature service for the collected data but also downloaded the code for Crowdsource Reporter to further customize the basic template. The GIS team added pertinent logos and map marker symbols, created a help section to assist new users, and manipulated the display for the information being collected. For example, the litter reporter does not display submitters' names or contact information, the description field, or any photos sent in—even though the basic template has those capabilities—to prevent any misuse of the information or public embarrassment. "This technology allows us to reach out to the community with a user-friendly interface and allows Keep Lake Beautiful to mobilize its volunteers more effectively," said Brian Sheahan, the executive director of Keep Lake Beautiful. Hosting the application and data on ArcGIS for Server and having county staff maintain it also allow better data management. The GIS team can extract specific information and report it to Keep Lake Beautiful's executive committee for audit purposes and to monitor the program's overall productivity.